Things typically calm down around this time of year, but for whatever the reason, this week was a busy one on a lot of different fronts. Let’s see how much of it we can cover. The first thing I want to get to is that mess of a blog post from Monday. I think I tried to do too much with limited space. Whatever the case, it became a convoluted mess that left several of my points buried and made it appear as if I undervalue SEL. SEL is certainly very important, but equally important is a love of content and the art of teaching. Yes, teaching is an art. SEL works best, in my opinion, when it is authentic. Bad SEL practice is every bit as harmful as a lack of SEL. I’m still not clear on where the line between great teaching and SEL practices fall or if there even is a line. Making it a job requirement to love everybody you are responsible for is a lot of pressure to put on someone. Imagine if I made it a job requirement for you to love everyone you work with. You can serve and respect, without love. How do you differentiate between results derived from district policy and sheer determination of teachers to ensure kids succeed? Isn’t it possible that two points of growth in actually is a loss of growth, because if policy aligned with teacher practice, growth would have doubled? We put too much on the plate of teachers both in expectations and in time requirements. Teachers are amazing, but we can’t expect them to be superhuman. Lastly, great teaching comes in all shapes, sizes, and looks. We should foster great teaching, not try to jam it into a cookie cutter model that fits preconceived notions. I hope that’s a little clearer. Tuesday was parent/parent conference time in MNPS. I just have to take a moment and say how truly blessed the Weber’s as a family has been by the teachers assigned to my kids. This is Avery’s 5th year at Tusculum and Peter’s 4th and they have had great instructors every year. As I sat in conference with this year’s teachers I couldn’t help but be struck by just how good they were. Let me just say, from the bottom of my heart, thank you. A million times thank you. Speaking of SEL practices, Avery’s teacher utilizes the conversation carpet. As I’ve learned this year, 4th-grade girls have a lot of conflicts. The conversation carpet gives them a place to resolve those conflicts. But as I said, the best SEL is rooted in authenticity, and Ms. Economos has the rep of being a “chill girl”. It’s that rep that empowers the carpet and makes it effective. Moving on, you might have heard me mention that Dr. Joseph is getting to the twilight of his first contract and it’s my belief that he’s currently preparing to bring up the subject of his next contract with MNPS. The current contract ends June of 2020 and therefore in an effort to avoid going into the final year with lame-duck status, he’ll want to get it done between now and February when budget season begins. Who better to champion a new contract but parents, unfortunately, parent involvement over the past two years hasn’t exactly been a priority. 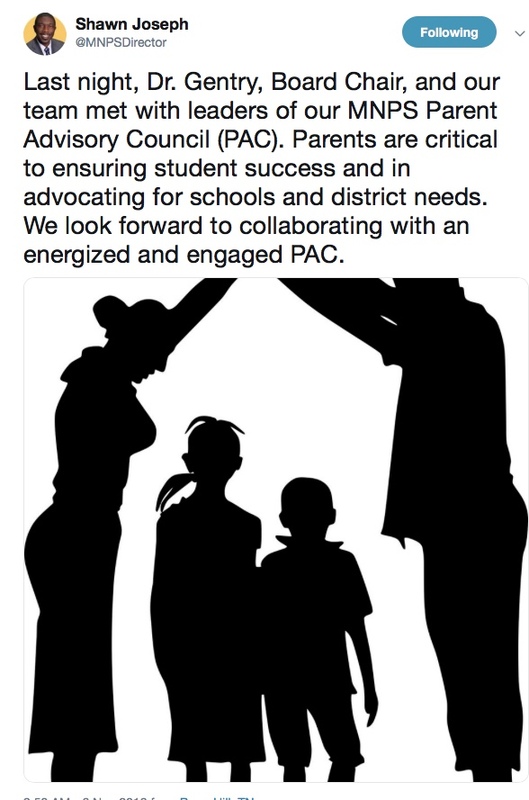 Previously in the district, there existed a Parent Advisory Committee. Each cluster had its own PAC which was made up of one representative from each school in the cluster. Each cluster PAC elected 2 representatives who would meet 4 times a year with other cluster representatives and the director of schools. It wasn’t always pretty but it did provide a pipeline to the director and allowed parents from across the district to come together and discuss district challenges and successes. The criterion for representation was transparent and uniform. Despite having a president, Barry Barlow, since Dr. Joseph’s arrival the district PAC has not met once. Cluster PAC’s have also gone dormant with only 3 – Overton, Hillsboro, and Stratford – having consistently met over the last 2 and a half years. I’m very proud to say that Overton stayed active through the efforts of Abby Trotter and myself, plus the tremendous support of the school administrators in the Overton Cluster. I know y’all are partial to your own, but we really do have the best. Last Monday, Dr.Joseph convened a group of roughly 25 parents from across the district to discuss what parent voice would look like going forth. He instructed the community superintendents to select one parent from each cluster across the district to be representative of their cluster. What were the criteria for selection? Who knows. That was left to the discretion of the superintendents who as far as I know, kept that information to themselves. Where did the other 13 parents come from you ask? Again, who knows. Everything was done in a very clandestine manner. Why do I say clandestine? Because the very day before the district meeting community superintendents sat in meetings with cluster parents and never once mentioned that such a meeting was even pending. That to me is the very definition of clandestine. If parent voice was truly the goal, why was notice of the meeting not given along with notice of who the representation was and the criteria of why they were selected? 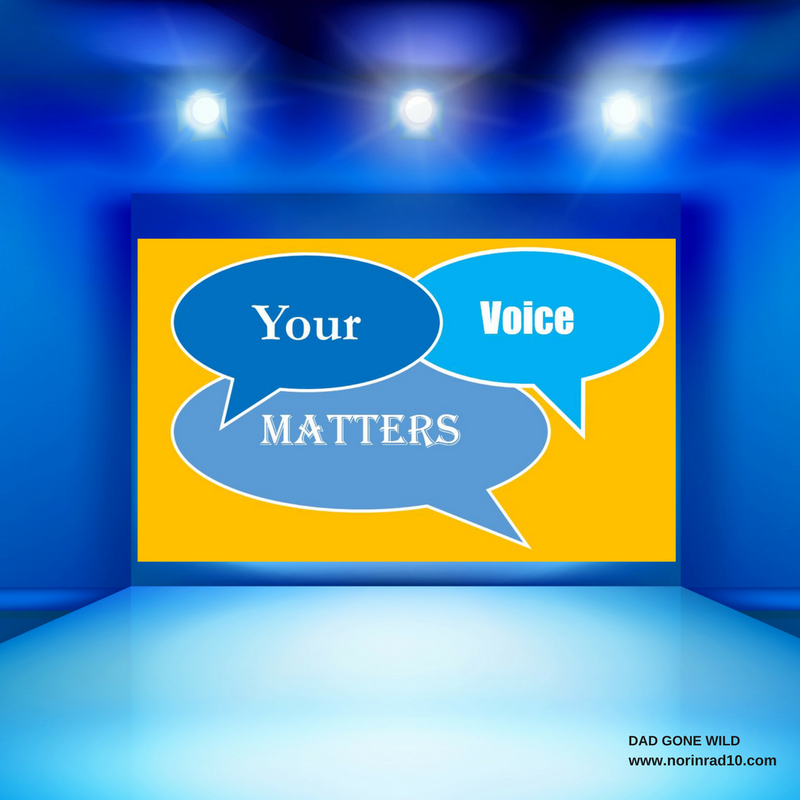 Would an existing parent meeting not be a prime place to garner information on what actually involved parents would like to see from the district. Instead, nobody said anything and I wonder how many parents even know such a meeting took place. Furthermore, in a follow-up tweet Dr. Joseph referred to the meeting as a PAC meeting despite many elected PAC leaders being excluded. Apparently, the meeting was such a success that another one is scheduled for the near future. 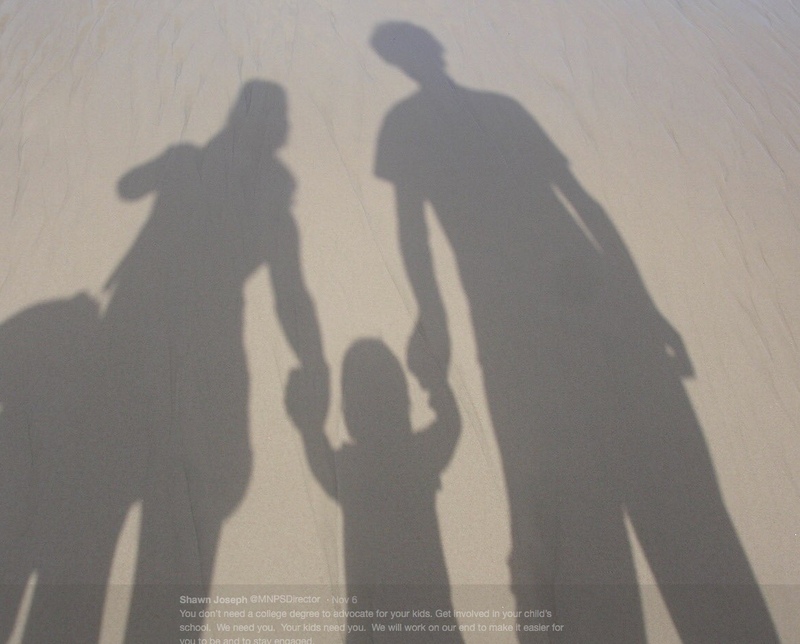 In this meeting, further steps will be taken to shape how parent voice is expressed in the future. Twenty-five people hand selected by district leaders will now dictate the model for parent voice going forward. District leaders love saying words like “transparency” and “equity”, but seldom do they live those words. Joseph also tweeted a bizarre tweet reassuring parents that they didn’t have to have a college degree in order to advocate for their child. Ok…glad that was cleared up. Don’t think for one minute that we are done with the sneakiness. As many of you know, upon Dr. Joseph’s arrival MNPS instituted MAP testing 3 times a year. What you may, or may not know, is that when administrating these tests, special needs students and EL students are supposed to receive the same accommodations – text-speech, read aloud – that they would receive on TNReady testing. Students did not receive those accommodations on the tests administered at the start of the school year. Parents were not officially notified that their children would not receive the expected accommodations at that time. In fact, many didn’t find out until the day of testing. Previously schools were directed not to administer the Reading portion of MAP with Read Aloud or Text-to-Speech accommodations due to concerns that administering with this accommodation could result in failure to identify students at risk. However, students eligible for accommodations have previously been identified as being academically at risk. That statement makes absolutely no sense because, first of all, MAP IS NOT A SCREENER. Let me say that again because, despite the “Dr” in front of their name many in MNPS can’t seem to accept it, MAP IS NOT A SCREENER. Per NWEA, the test creator, there is a screener version but the district utilizes the growth model. I know you’ve been led to believe that we have the Super Duper Magical MAP test that does all things for all people, but that is not true. Using the growth model for a screener is like using a hammer for a screwdriver. Both are useful tools but perform very different functions. After several parents drew district leaders attention to the fact that by not allowing accommodations, the district was not in compliance with federal regulations, the accommodations were miraculously restored. This is important information for parents to know. Many of you will have parent/teacher conferences that include MAP data. Now that the accommodations have been restored, some special needs and EL students will show miraculous growth. Based on this growth, a parent may be presented with the theory that their child’s MAP scores suggest that they don’t require special services. Please don’t be fooled. In a couple of weeks, we will begin a districtwide discussion about MAP scores. With at least 8000k students now receiving accommodations who didn’t receive them on the initial test, I don’t know how you have an authentic conversation about results. Are the scores of all those kids going to be factored out? And if so, how accurate a picture does that paint? One last thought on data, which I unsuccessfully tried to address earlier in the week, how do we draw a cause and effect line when it comes to the data we have? All schools across the district are not implementing district policy with the same fidelity, so how can success, or failure, be attributed to policy. By Dr. Joseph’s own admission, all schools do not have access to the same resources required in order to fully implement district policy. How much impact does that have? How much impact do individual teachers have? It may just be me, but I see way too many variables to be able to discern whether it’s causation or correlation at work. Over the last couple of weeks, there have been a lot of whispers around funding next year for enhanced option schools. These are schools that were empowered with special provisions through past desegregation acts. One of the big provisions being the extended school day. The talk has been that the district put pressure on these schools to end the extended school days. The district says that’s not true. Their only desire is that schools be a lot more intentional with their funding. 2018-19 student enrollment at the Enhanced Option Schools runs between 242 to 385 students at each school. The funds provided to each school for the extra 45 minutes of school/day ranged from $200,000 – $280,000/school based on enrollment. Most of these schools also receive a baseline supplement because the small student enrollment does not generate adequate money to fully staff a building in the student based budgeting model; these baseline supplemental amounts ranged from $237,140- $423,682 per building for 2018-19. The schools will not lose that money, either. The only precaution given in the meeting with school leaders and in response to individual questions was that any request for an “exception hire” may not be honored. (An exception hire request is to cover a unique situation that was not included in budgeting.) Enhanced Option Schools receive Title I funds that can cover those unique types of requests. Only two Enhanced Option Schools received “exception hire” funding for the 2018-19 school year. The district’s position appears to be a reasonable one. But, this is where the establishment of trust is so essential. District leaders have failed to build up the level of trust needed in order to be effective. As a result, reasonable initiatives are looked at with nefarious intentions, as in this case. The other thing is timing. This administration loves to present things up against a deadline. That doesn’t work well with most people. You have to implement things on a proper timeline. Rush people and they’ll feel like you are trying to bully them into a position, even if that’s not your intention. Again, a factor in play here. Tennessee has a new governor in Bill Lee and when it comes to education he’s already making missteps by referring to Tennessee’s education system as being at the bottom of the nation. He quickly walked that one back. Many public education advocates are already wringing their hands over what policy Lee, an avowed fan of vouchers, might push. Let’s take a deep breath and see what steps he takes first. I would remind you of the unpopularity of education reform policies – vouchers, wholesale charter school growth, Teach for America – across the country. Whether its Newark, Indianapolis, Denver, New Orleans, or Memphis, nowhere in the country do those policies hold widespread appeal. Hopefully, Governor Lee will surround himself with people who will advise him on much sounder practices. The arguments only get tougher for the ED reform crowd as more data is now available as opposed to as recently as two years ago. There are some charter schools that perform at a high level, and some that do not. Just like traditional schools. In light of the fact that neither is a magic bullet, why dismantle a system that has served the country well for years? It doesn’t make sense. Let’s invest in our existing schools before peeling off resources for a new unproven system. Speaking of Teach for America, they have now arrived in Chattanooga; 15 teachers, 4 years, one million dollars. But that’s not the whole of it. Those in favor of the agreement — which will actually cost about $3.3 million over five years — emphasized that the board’s $250,000 a year commitment is coming out of state grant money for the district’s priority schools. But don’t fret Nashville, you’ll get an opportunity to spend more of your hard-earned priority school cash as well. The Nashville TFA contract is up for renewal soon. But perhaps, Nashville will have spent all its extra money bt then. If you’ll remember, last month we gaven TNTP a half million dollars to provide professional development for teachers employed at priority schools. The school board approved this expenditure despite being told over the summer that not a single school was utilizing TNTP for PD. This month we’ve got another cash prize for TNTP. SERVICE/GOODS (SOW): Amendment #2 to increase the total compensation by $434,601.72 to reach a new not-to-exceed amount of $595,326.52. Amplify Education, Inc. will provide Core Knowledge Language Arts (CKLA) Classroom Kits and associated materials to MNPS Priority Schools. Don’t be fooled by the name Amplify attached to this ask, TNTP is the vehicle being used to implement CKLA in metro schools. I plan to write more about this in the upcoming weeks, but the short version of the story is that we are investing this money in CKLA at the same time we are partnering with Florida State University and utilizing various MNPS schools to conduct an experiment on the effectiveness of CKLA. Which schools do you think are participating in this experiment? Have parents been fully briefed on the pending experiment? You would think such a high profile undertaking would be all over the MNPS website, but if you thought that you’d be wrong. All but gone is the assumption that the purpose of schooling is to benefit the community at large. Less and less often do Americans conceive of education as a cooperative effort in nation-building or a collective investment in workforce development. Increasingly, rather, school comes to be viewed as an intense competition among individuals to get ahead in society and avoid being left behind. It has begun to look, to a great extent, like a means of creating winners and losers in the pursuit of academic merit, with the results determining who becomes winners and losers in life. Do you know what MNPS school board member is heading up what committee? I know it’s only November but I’ve yet to see an announcement. 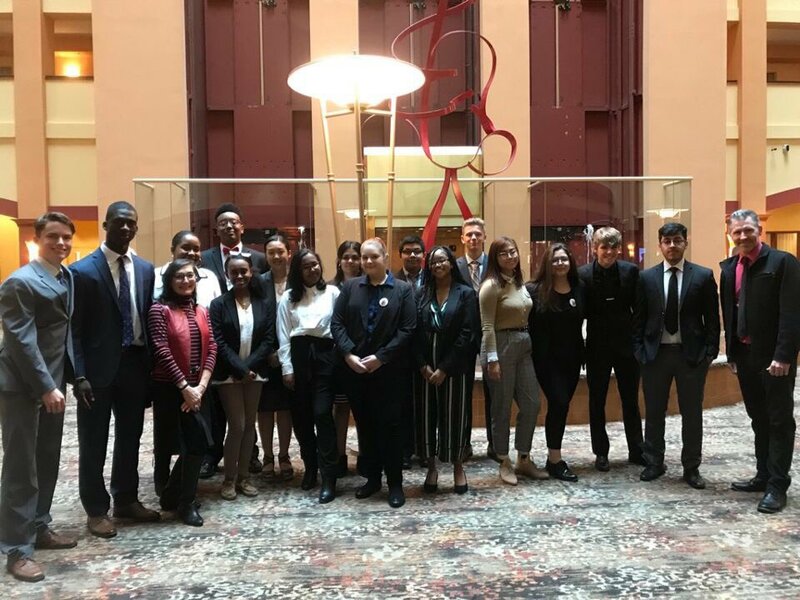 Overton Model UN Delegate Conference is this weekend! We want to wish this great group much success!!! 5 teams and 3 officers!! 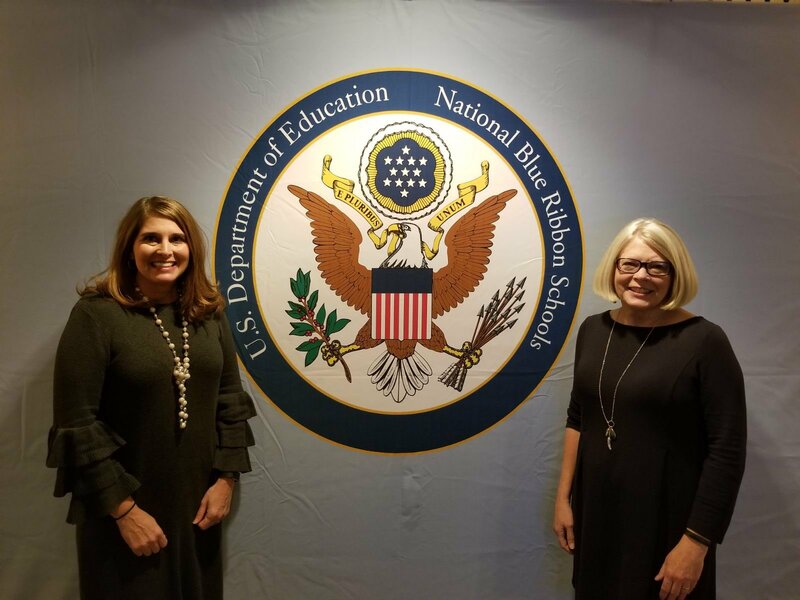 Dr. Kellie Hargis, Principal of Hume-Fogg HS and Mrs. Cathy Parsons, English Teacher, accepted the National Blue Ribbon Award from the US Department of Education this week. Congratulations to the entire Hume-Fogg community for your commitment to excellence! Here’s some good news to share. MNPS, as a direct result of the decision to pay for tests, has increased the number of students taking advanced AP classes. “Prior to last year, we didn’t ask students to take advanced academic tests because we couldn’t ask them to pay. Or they would opt out due to the cost,” said Laura-Lee Morin, Metro Nashville Public Schools advanced academics director. This is a huge deal. Even though the number of students earning college credits didn’t increase – students earn credits by scoring a 3 or above – the number of students did not fall back. Some people may choose to focus on the results of those taking the test, but granting access is an important first step. This one deserves to be bragged on. This has all kinds of “advantages”. You buy only one MAP version. You don’t give FAST to thousands of kids who won’t benefit from the info the scores provide. You only give FAST to a small bunch of kids who presumably are well identified as good candidates for screening. There are of course disadvantages. Your screening cannot be viewed as being “universal screening”. You are pushing the use of MAP past it’s useful bounds. You might just miss a few kids who test just above the border for MAP but would have been screened into services by FAST. It all makes sense if your two main goals are (1) to use MAP on the general ed population and avoid having to use a properly rigorous approach for sped screening and (2) above all else decrease the costs of the sped department. Bottom line: MNPS may not be overtly looking to find reasons not to give a kid services, but in so many ways they ar seeking to unburden themselves on that front. The state has done its best over the last 5 years to aid and abet this goal using RTIIMTSSwhatever ias another codename for avoiding true services while creating a mandate that is approximately 10% state funded at best. You should check to see if your school district used any funds for consultation with The Boston Consulting Group. BCG is known for it’s ability to skew/produce data for school districts to underfund/undermine special ed services for those that need it the most. Special ed is expensive and BCG is good at recommendations to gut the programs. MAP scores/NWEA plays a part in this devious scheme. Amplify!? Good lord we are hosed. Rupert Murdoch put a cool billion into that donkey before pulling the plug and selling it back off. How they survived I don’t know but some people have nine lives. Helps to have the right friends I guess.